This four way DVD flip display makes to most out of valuable retail space. Sporting four shelves per side, it is simple to display a large amount of inventory on one display. 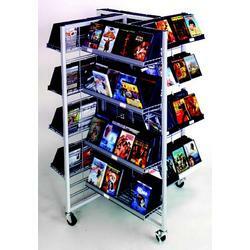 Each unit is supported by rolling casters, making this retail display easy to move to another location.